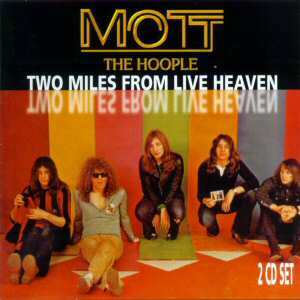 Mott The Hoople CD: "Two Miles From Live Heaven"
I know reviewers are supposed to say more than this, to show great insight and pretend they've listened to the disc many times before passing judgement, so here goes. In their day, Mott The Hoople were one of the best live band around, and 30 years on are still regarded as being one of the best live bands there ever was. It is unfortunate there was little evidence of this in recorded form in their day, something that Angel Air are making a great effort to remedy. So far they have concentrated on the early (Mk1) line-up, hence this welcome release which spans both the early (Mick Ralphs) and later (Ariel Bender) line-ups. Disc 1 features shows from 1971 and 1973. The 1971 show has Mott in an uncompromising mood, with Ian berating the audience for "sitting down, knitting" before they launch into a brutal version of Walkin' With a Mountain. Mott certainly take no prisoners here with Whisky Women coming over much heavier than on the album, while Angel of Eighth Avenue is as beautiful as I've ever heard it played. Apart from a couple of glitches on No Wheels To Ride the sound quality is excellent. Next up are four tracks from 1973 and taken I believe from a TV show (Don Kirshner?) and possibly Ariel Bender's first gig. Jupiter segues neatly into set-opener Drivin' Sister, the performance being perhaps a little more restrained due to the TV cameras. Angeline shows Mott's self-deprecating humour as during the mid-song rap Ian says "actually we're not very popular, this girl here was a plant...". Sheer brilliance. The disc concludes with four demos from the 69-71 period. Of particular note here is The Rebel - although several versions were recorded, this is the version with Mick Ralphs on vocals with Guy Stevens producing and so must predate Ian Hunter joining the band by a week or so. And so to disc 2. Recorded at the Santa Monica Civic Center on 12th April 1974, it was originally broadcast on FM radio. As such it has received several unofficial releases over the years, but never in this quality. By now Mott were a major live attraction, and were firing on all cylinders as they finally seemed on the verge of breaking through Stateside. Do Mott deliver? You bet. in its various forms this show has always been a favourite with fans, and the one the fans have been clamouring to be released officially for a long time. Just put the CD on, crank up the volume and revel in 70 minutes plus of sheer unadulterated rock n roll. From the powerful, brooding menace of Sucker through the brilliant coupling of Roll Away The Stone and Sweet Jane to the explosive climax to the rock medley (Drivin' Sister/Crash Street Kidds/Violence) this is Mott The Hoople at their very best. The booklet as always is detailed and informative, and describes each of Mott's five US tours between 1970 and 1974. So, lavishly packaged, great performances, excellent sound quality. In other words, awesome. Post-review notes: Wolfgang's Vault gives the date for the Fillmore West show (1 above) as "July 9th, 1970". I believe that to be incorrect (and the date I've given above correct) for several reasons. Mott would have been promoting their first album in 1970, here they are clearly promoting Wildlife, which had only recently been released. The tracks listed do not correspond to Mott's setlist at the time. Ian also comments that they had hoped to come back earlier but that the drummer (Dale Griffin) was ill; Mott had pencilled in a second US tour for late 1970 which had to be cancelled after Buff fell ill, again dating this show to 1971.